Few events in life are as painful as a divorce. Selecting an Orlando divorce lawyer should not be painful or difficult. You want an experienced lawyer on your side that will negotiate fairly, fight when appropriate, and know which circumstances demand which approach. Often a family law matter is the first time a person will ever need an attorney. Anger, frustration, and many questions complicate the situation. Will you lose custody of your children? Your spouse won’t pay child support – what can you do? Can you move away from Orlando, or relocate outside of Florida with your children? You need know what your rights are and what options you may have. they have the experience and skill to advocate for you. Although divorce is one important part of family law, it is certainly not the only component. In all areas of Florida family law, the lawyers of the Kramer Law Firm provide a deep and comprehensive resource for you and your family. Couples often envision divorce court as their only option. Divorce mediation offers a respectful and cost-effective method to resolve disputes and reach a settlement that best suits your family’s values, goals and needs - without going to court. The Orlando divorce lawyers at the Kramer Law Firm are strong advocates of alternatives to conventional divorce. We will help you come to an agreement regarding every aspect of your divorce, including child custody, child support, and marital property division. We can help you find common ground so you can move forward with dignity and a solid foundation for co-parenting children together. Divorcing couples may be struggling with extreme bitterness, a reluctant spouse, or domestic violence. These and other issues can prevent mediation from being a viable alternative to formal divorce actions. Regardless of the level of contention, there are many different components of the divorce that require an attorney to ensure that your rights are protected. Each Orlando divorce lawyer with the Kramer Law Firm has the experience and knowledge to handle any divorce litigation, no matter how complex. We can assist you through the most difficult situations that occur in traditional divorce proceedings. People seek modifications to make sure that their child support and child custody arrangements reflect significant changes that have happened in their lives after a divorce judgment is issued. Your divorce decree is a legally binding document. The guidance of an experienced Orlando divorce lawyer is critical to avoid noncompliance. We have helped hundreds of parents achieve workable outcomes and we are confident that we can help you. Not all family law matters involve the end of a family relationship. We are also accomplished adoption lawyers, as well as legal counsel for Florida prenuptial and postnuptial agreements. Our attorneys will assist you with paternity actions, property issues, and appealing family law court rulings. Hiring an Orlando divorce lawyer is a serious decision and one that should not be taken lightly. We understand how important your decision is. Whether you are ready for a family law attorney or still exploring your options, we are here to assist you. Our site is rich with knowledge of Florida family law. Visit our Video Channel and other family law resources to get important information right away about Florida divorce mediation, separation agreements, property division, alimony, child support, post-divorce modifications, and much more. Let us tell you about our approach to the law, and how we help our clients. 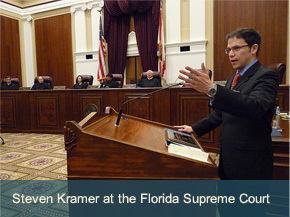 When you are ready, contact an Orlando divorce lawyer at the Kramer Law Firm. We welcome your call.